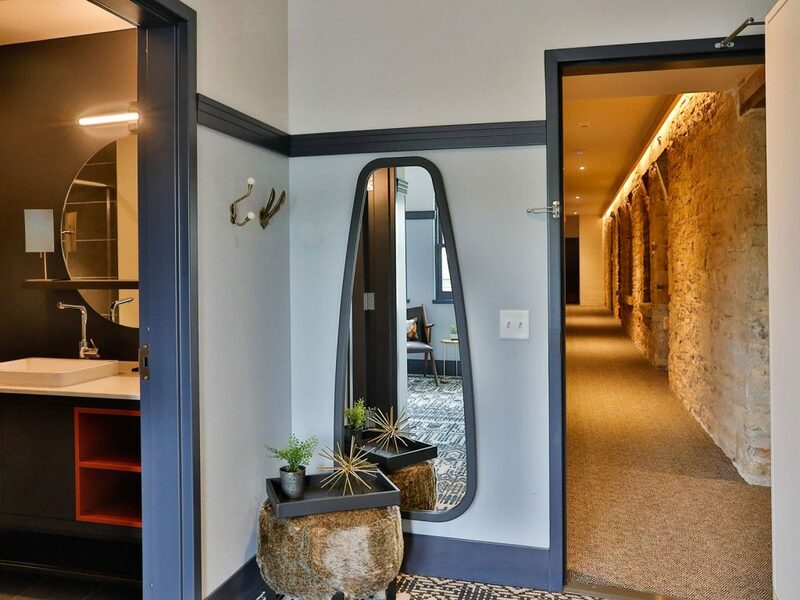 The new boutique hotel earns design acclaim for its unique rooms, Scandinavian aesthetic, and construction into the natural limestone caves along the St. Croix River. But the boutique hotel created by the Minneapolis architecture and design firm ESG, next to the now-closed Vittorio’s (which offered Italian food, as well as wine tastings and boat rides in the caves carved into the limestone cliffs behind it), is a draw for design buffs, architectural historians, and anyone else seeking respite from city life. 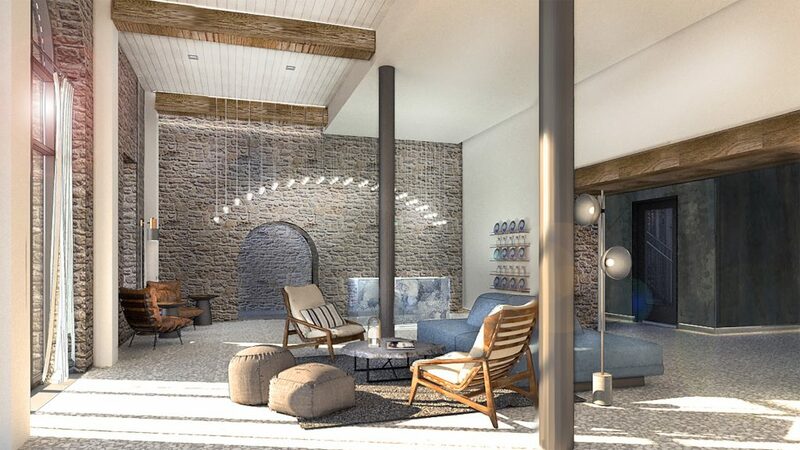 The 40 rooms (and 10 room types) feature in-situ limestone, concrete and painted brick walls—with timber beams intact. 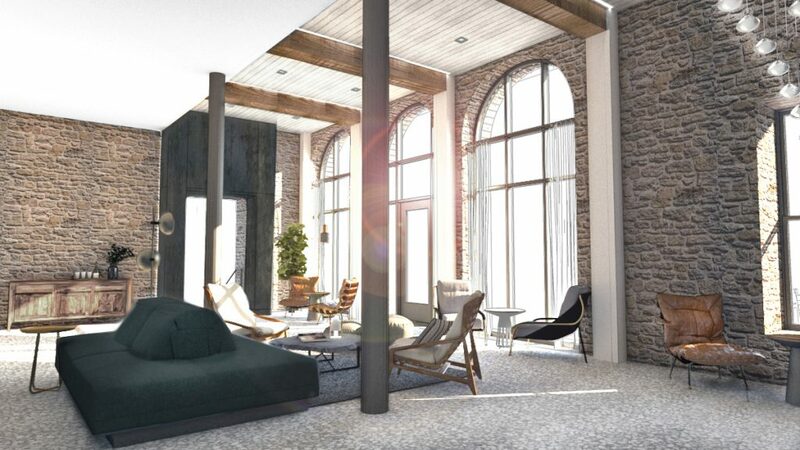 Cuts through limestone walls (ESG connected four structures, built during different time periods and on seven levels) create portals to guest rooms. Two of the rooms don’t have windows, but subtle illumination and the serene silence make up for the lack of daylight. In a nod to the area’s Scandinavian heritage, some rooms are painted a Swedish blue. Floors are covered with carpets featuring a custom Scandinavian pattern. Local art (including by nationally acclaimed Native American artist Julie Buffalohead) graces the walls. Blankets from Fairbault Woolen Mills adorn the beds. Treats by local artisans welcome guests. The Box Group in Anoka, which is owned by Corey Burstad, who also was the project’s developer, built the simple, modern case goods. The soft seating comes from West Elm. 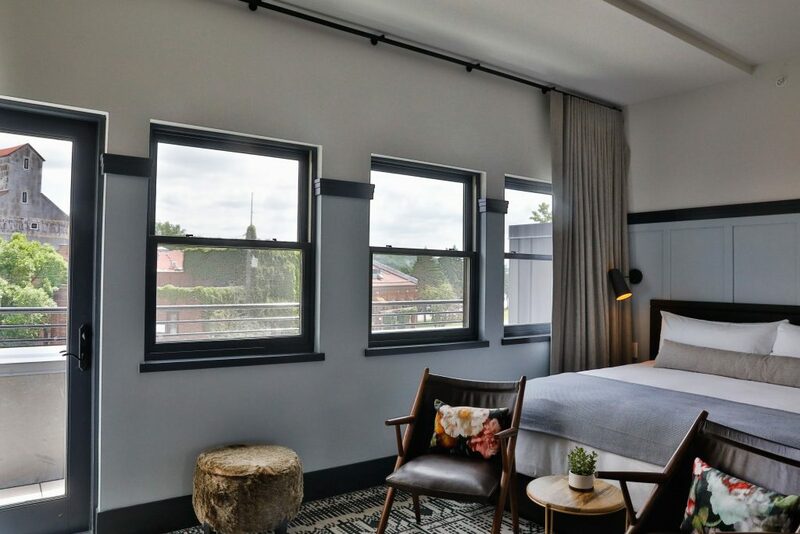 ESG interior designer Bridget Mugan and her team delved into Stillwater’s cultural history to come up with a singular design narrative for the hotel. Lora, she explains, is an abbreviation of Lorelei, the water spirit of German fairytales and myth. Who’s to say “Lora” didn’t inhabit the miles of limestone caves beneath Stillwater, across from the St. Croix River, in mythical times? The team took this whimsical, folkloric approach further, but discretely, by including in the guestrooms coat hooks in the shape of hare ears and deer antlers, and art work with a dreamy bent. Some doors are painted red, in homage to the eyes of the state bird: the loon. The block also includes Lora’s restaurant, Feller, which has a “hunt-and-gather” menu and wallpaper murals by local artisans She She. Fittingly, the restaurant features a charred-wood and stone materials palette, large display kitchen, and party room with a window into the caves. The Long Goodbye Bar (a reference to Minnesotans’ propensity for, well, long goodbyes) mixes local spirits into craft cocktails. There’s also a coffee and juice bar, MADE. Behind the lobby desk is a large opening into the caves (to be opened in a future phase). In the elevator lobby, on a stone wall, is a hand-cut paper representation of Lorelei, ushering guests into the quiet, calm and historical culture of Stillwater.